This is one of the last of my annual harvests. I did manage to get a bit of spring honey. The city sites in and around Wandsworth produced well. I can always count on my city sites each year as there is an abundance of nectar producing flowers in the city and the temperature is warmer and more consistent. Just a few tips about extracting honey and hygiene: keep your extracting room spotlessly clean! I stack my supers on the trailer and before bringing them into the extracting room, wipe them down on the outside with a mild disinfectant and rinse with clean water. It’s just nice to know that no mud, grass, twigs or bees will be brought into the building. Health & Hygiene laws set out useful information to follow when designing your extraction room. A modern kitchen will in most cases do. The basic requirements are wipeable walls and floors. The ceiling should be clear and free of dust collecting items. Hot and cold water supply. Your extractor should be stainless steel, not the basic metal ones of days gone by. They are nice to look at, but as honey is corrosive and reacts to metal-not a safe idea. Food grade plastic has replaced metal for that very reason. Now lets talk about Ripe Honey! I have a vast private collection of honey from all over the world and I am amazed at how many on offer for sale have fermented in the jar. If the lid is slightly convex (bowed) its a sign that there is a build up of internal pressure in the jar. If the water content in honey exceeds 20% there is a good chance that the shelf life of that honey will be greatly reduced and natural fermentation will occur. The honey is spoilt. So to avoid this, here are few tips. 1- If the frame of honey is predominately uncapped, it might be a sign your bees have not driven out the water from the nectar yet. Bees are remarkable little creatures and if left to their own devices they will ‘ripen’ the honey by removing a vast amount of the water contained in the nectar, reducing it to around 20-18% water. The lower the percentage of water the better. Shake the frame of honey downwards if any nectar falls out, the honey is not ready to extract. This is a simple little telescope like device. It has a flip lid and you simply put a drop of honey on the inside of the flap. Look through the lens which has level lines showing 1-60%. It measures the water in the liquid. Quick and very accurate. 3- Wash and DRY all jars. You don’t want to contaminate your perfect honey with water at this point. There is a lot of controversy over this issue. At present the EU are setting new guideline laws in respect to the filtering of honey. They want to see producers label their honey with, ‘ Filtered Honey‘ if they use a fine filtering system. The idea is that consumers should be made aware of this fact, as fine filtering does filter out a considerable amount of the nutritional value of the honey. Fine filtering consists of heating the honey, pumping it under high pressure through a micro mesh filter system. Most hobbyist beekeepers will never have to worry. Like you, we use a gravity system using muslin cloth of a wide grade. It allows trace elements of pollen and propolis through, which most consumers will want and appreciate. Filtering also ensures there will not be any surprises in your honey. Your honey should be clear of wax and foam bubbles. To avoid the foam ( air bubbles trapped in the honey during the extraction process) decanter the freshly extracted honey into a large food grade bucket. Allow this to stand for 48 hrs before bottling. All the trapped air bubbles will rise to the top of the bucket. Your tap is located at the bottom, so all the honey that comes out will be free of bubbles and crystal clear! Store any jars of honey out of direct sunlight. Its funny how many times I see shops displaying their honeys in the windows of their shop. It looks great but UV sunlight ruins honey and should not be sold thereafter. Avoid this please. This should be enough for now. 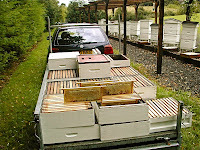 I’ll tell you more about the storage of supers, feeding and closing your hives down for the year next! Let me know what you have collected this year and how your bees are!